i've seen number 5 on pinterest, didn't know they were topshop! i'm obsessed w tory burch at the mo, went into her stores in america & was tempted to buy an ipad case (yeah, i know i don't yet have an ipad!). Got some free notepaper instead! she has a good instagram & blog too.. Number 5 are by a brand called Joules but they are for sale on the TS website randomly. 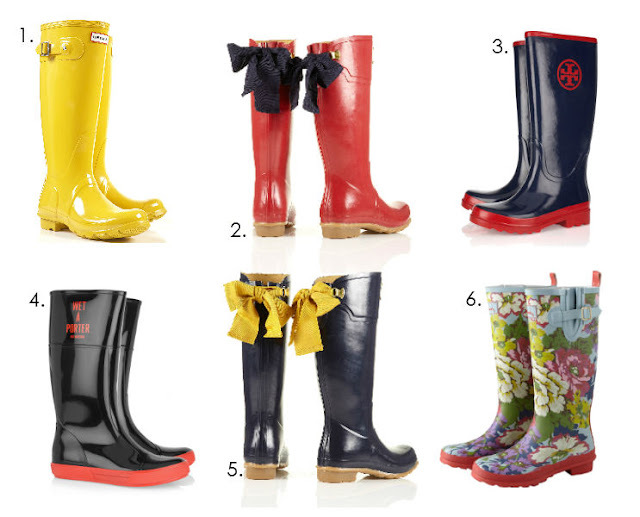 Joules do the best wellies! You could totally use a Tory Burch ipad case as a clutch. I'd love a pair of her pumps, such classics. I shall check out her blog and Instagram now, thanks for the tip! good idea about the clutch/ipad thing! LOVING the new look! the follow buttons on the side are perfect! i love those boots! so comfoltable and fashionable! loving those moschino ones!! i need some rain boots ASAP! The bows are my favourite! Key festival purchase for me I think! Ribbon wellies are so darling!